A world of eternal day and everlasting night, burning deserts and frozen wastes. A people exiled, seeking the truth about their past, long lost in vague, yet disturbing, myth and legend. Technology lost, then found again. A realm of priestesses with remarkable powers and implacable purpose, who worship a powerful god; a star that blazes unchanging in the skies above. A star which is poised to unleash devastation upon them all. Two Children are smuggled out of Scallia to save them from the feared witches of Drayden, but the ‘rescue’ doesn’t go well. Cast adrift with no memories of each other or their real family, both grow to adolescence friendless and destitute. All that stands between them and brutal early deaths are the talents they barely know they possess... and can’t control. Drew is donating 10% of the proceeds of this book to the March Wood Project, whose work involves rehabilitating teenagers among the beautiful woodlands of Kent. 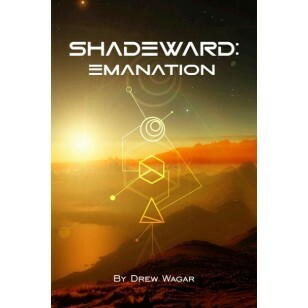 Exoneration by Drew Wagar is the second in his acclaimed Shadeward series. This is meticulously researched science-fiction with a feel of fantasy. Continuing the saga from book 1, Emanation, the secrets of this fractured world gradually unravel as the truth behind myth and legend emerges. The impetuous Meru plunges into a world of technology he can barely understand and finds himself facing the terrifying priestesses of Drayden, his fate interwoven with Kiri and Zoella, the misfits we first met in book 1, now two very different characters. Their history plays out under a star that blazes unchanging in the skies above them, a star that has been a permanency in all their lives, a star about to unleash terrible destruction.